We've justed posted details on a new slate of Travel Photography workshops and have a unique gift idea to share for the Holidays. The workshops schedule also adds a pair of four-day workshops to be held in San Francisco and Dallas. We also have the first of many new Nikon D300 and D3 tips: with a quick look at White Balancing improvements. - Banff, Alberta, Canada National Park, Bow Valley, Lakes. All of these trips will be a mixture of classroom training and field photography. We've chosen some of North America's most beautiful locations to host our travel and nature photography workshops. You'll learn about setting up your Nikon Digital SLR, professional field techniques, refining your creative vision, software and techniques for taking amazing photographs. These trips will be an incredible opportunity to learn photography in a hands-on, real world environment. They are all focused on making memorable images, so we'll be waking up early and staying up late. We have a few more workshops to post (Olympic National Park is on the list) and we'll do so when we get venues and dates locked down. Looking for a good present to buy your spouse in time for the Holiday Season? Why don't you get them what they really want ... admission to a Nikonians Academy workshop. You can buy a workshop seat and then give it to your spouse or friend as a Christmas present. Help your favorite person learn how to print in our hands on Digital Workflow and Printing workshop. Check our Nikonians Academy website for the schedules that fit your location and scheduling opportunities. Our January schedule takes us to Houston, Los Angeles, San Francisco and Vancouver BC. We have a new four-day workshop to announce posted called Advanced Digital Imaging Workflow. This will only be held in two cities this year; San Francisco Bay Area and Dallas, TX. The workshops will include full printing labs, computers, software, monitors, calibration equipment. We will provide everything you need to succeed at digital workflow and digital printing. These are four days of advanced instruction for advanced photographers. Here's a quick White Balance tip for all you Nikon D300 and D3 users out there. With my previous Nikon digital SLRs (D2X, D200, D80, D70, etc.) I've liked to set my white balance for Cloudy -1 when taking photos outdoors. I would set it this way for general photography because I like the additional warmth that the setting created for my photos. I found that Cloudy -1 best reproduced the warmth I'd get in my slide film days when I used an 81A warming filter. 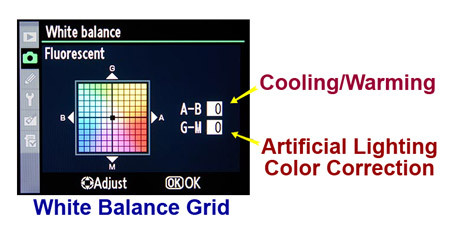 Now, with the D300 and D3, we have a new way to fine tune our white balance by using a four color axis chart! To get to the same setting as Cloudy -1, I now set my Nikon D300/D3 for "Cloudy A2." The "A" stands for amber and the "2" is the fine tune amount. The scale goes from A1 to A6. A2 changes the color by approximately 10 mired (my-erd). Really, what's happening is you are changing the white balance from about 6000K to approximately 6200K. The White Balance grid is called the A-B, G-M grid and it allows much greater control over white balance than we've ever had before. A-B stands for Amber - Blue. G-M stands for Green - Magenta. The Amber - Blue axis typically is used for warming (amber) or cooling (blue) your photo. These are the traditional white balance controls. The Green - Magenta axis is used for color correction purposes in artificial lighting situations. Back in the film days, we'd use CC (color correction) filters to help balance indoor lighting scenarios. For example, we used a Magenta CC filter to balance fluorescent lights to daylight color film. Most of the time, you'll be making your changes in the A-B axis, however there are times when you'll be confronted with difficult artifical lights, and you'll make a change in the Green - Magenta area to get consistent colors. We've created a new workshop on the Nikon D300 that will help you navigate the new features available with this camera. Check out all of our workshops at the Nikonians Academy website.